City Tourism and Culture Dept. has spread 700 stickers about open-close entertainment venue operational on the first day of Ramadan. It is done through 45 officers.
" 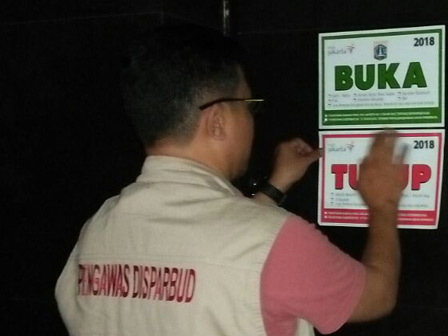 During sticker installation, no entertainment venues operate"
Tourism Industry Division Head, Tony Bako stated, it is done simultaneously in five areas, starting on Wednesday (5/16) night until Thursday (5/17) early this morning. "During sticker installation, no entertainment venues operate," he expressed, Thursday (5/17). There are two types of stickers with different colors. Especially for green sticker, it is for the opening hours for karaoke, restaurant bars and so forth. While the red sticker, it is for the closed hours during Ramadan, such as sauna, spa, griya massage and so forth. "We have 700 stickers that consist of 300 stickers with green color and 400 stickers with green color," he stated. Based on the data, the number of tourism industries that have to close down during Ramadan is reaching 373 places of business. While the tourism industry that is allowed to open with time management is about 770 businesses. While he place that is allowed to remain open is 363 businesses. "This policy is according to Bylaw No. 6/2015 on tourism and gubernatorial regulation No. 18/2018 on implementation of tourism business," he uttered.